-Realistically, I had probably only seen photos of Bobby up to this point. Maybe a clip in a 411 or something, but that’s it. My awareness of him would have been from photos in Slap. I was a fan from those and had a bit of an idea of what to expect when “Shangri-La” by The Kinks kicked in. The intro is stellar, done long before the days of Manhattan skyline shots becoming clichéd staples in “trip to New York” edits. Bobby stepping off the train into his earthly paradise is a shot that always stayed with me, as did the sideways push out of frame as the film burns off. -In the future I think I should test myself by guessing what the first trick in a part I’m going to write about is. That said, there’s no way I would have remembered that this part, featuring one of the most quintessential street skaters of all-time time, starts off with a frontside pivot on a nearly vertical DIY quarterpipe. So I’ll take an X on this one. -While many would credit Crailtap-related skaters like Anthony Pappalardo, Rick Howard and Marc Johnson with popularizing the white tee and brown cords look that was prevelant in the mid-to-late noughties, let us give much credit where credit is due and recognize Bobby’s kit on the downward Bluntslide and many subsequent tricks in this part. -When I think about quick set-ups and quick feet in tight spots, Puleo is always the first person I think of. You can see it in all the first tricks, especially the flow he carries on that tabletop ramp Ollie through to the quick 50-50 after. -Speaking of footwork, he always made those Ipath Grasshoppers look so cool, like a shoe that you could skate nimbly in. Once I actually saw a pair in real life though I realized they were huge and stiff. So somehow Bobby was able to stay nimble and quick-footed in these hightop boots with the Velcro flapping off on the side. Oh, remember when the Velcro strap became a fad on every skate shoe? -How much fun does that Backside Tailslide on the bank to ledge look like? It’s an example of fine editing too that this clip is followed up by Bobby piloting an Ollie off the steps and into a similar bank. -Our first cellar door appearance. Not only is it the most beautiful phrase in the English language, but it’s the type of spot most associated with Puleo to this day. -That is one heck a beautiful and unexpected Kickflip on the street version of a euro gap, while the Backside 50-50 across the step then gap to landing on a cellar door is the Puleo you expect and love. -I like how the filming on the brick bank to curb goes from long lens to fisheye when he Backside Blunts it. Turning out right in front of the camera, while giving you a weird reminder that he skated for Enjoi at one point. I’m not sure if that’s actually an enjoi board that he’s skating, but it looks enough like a panda face quickly flicking by that it made me think about that. -What makes the Switch Backside Nosegrind rad is how you can clearly tell it’s switch because of his shoulders and arms. It reminds me of a quote about Van Wastell trying to 50-50 a handrail but have his body set up so that it looked switch, just for fun. -The Salad grind 180 out gives a better look at that same board from earlier, but I’m still not entirely convinced it’s a panda. The more I look at it, the more it starts to look like something else. In an interview with TWS, Bobby made it seem as if enjoi approached him after Static II came out. So if that’s not an enjoi board, this might just be a conspiracy, like Back to the Future predicting 9/11. -I love him tiptoeing away in that waterfront shot. From what you hear about Bobby (and occasionally read from him), he seems like a very serious person, but between these clips and what I took from his Bobshirt interview, he can be a pretty easy going and thoughtful guy. -That Nollie Full-Cab over the bench is the best example to me of how Grasshoppers could look slim and nimble when they were in fact neither of those things. -The backside 360 with that gentle and (sarcastically?) 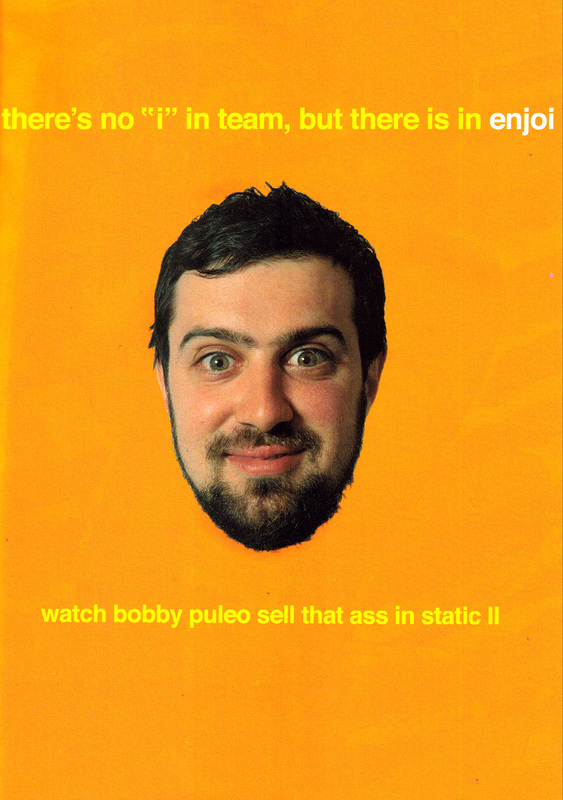 smug roll away off the ledge is the first trick I think of when I think of Bobby Puleo in Static II. Rad trick, rad angles, and it’s well-timed with the song. -This is Puleo boiled down the base-level Puleo. Pushing through the streets at night, in brown cords and a white tee, grinding a random stair into a small bank. -I love the Noseslide snap and gap out to fakie onto the green cellar door, and then continuing onto cobblestone. It’s a good combination of trick, colours, spot, and style. -The Backside Ollie across the channel has always seemed so out of place in a Puleo part, but it’s a trick I have referenced on more than one occasion mid-session, so it clearly did it’s job of standing out, but not in a sore thumb kind of way. It’s something we touches on in an interview with Village Pyschic from last year, when he talks about Guy Mariano’s Switch Wallie/Pole Jam grind in Mouse. -Would you believe there’s a double-flip in this part if you hadn’t seen it? I wouldn’t have and forgot all about this. This is another fine example of back-to-back clips on the same spot, but each with a different approach. The criss-crossing hairpin turn of a wheelie always feels nice when you find a bank to Ollie up into manuals on. -With regards to the Backside Nosegrind on the wavy flatbar, I am quite confidant in saying this is the best and only trick you need to see on this spot. -I wonder what the guys in the background thought of the quick push and Ollie into the red ramp/bank/cellar door. I think there was a photo of this trick too. Super sick, with a high splat-ability rating going into that steep bank. -The Frontside 180 Fakie 5-0 180 out on this SF sidewalk is kind of a perfectly flowing trick for this spot. -The Frontside Crook on the bank to ledge gives another look at the board. Ok, it’s definitely an enjoi board, right? Again, when it goes by quickly I’m sure of it, but when I pause it I lose confidence. It starts to look like a bunch of different things to me, including a Gonz Vision board, which I know it’s not. At least I think I know it’s not. -That powerful and confident Noseslide and then the Backside 5-0 go down at what is now a standard NYC spot to see pop up in clips. Was this one of the first times it was seen on film? Being that it’s Puleo, I’d bet on it. -I can’t help but think of Pappalardo in Mosaic when I see that Switch Ollie over the bar. Also, how does Puleo land so casually right next to that cement block? -That bank to bank Kickflip on the sculpture in London goes by pretty quick, but take a minute with it, because man is it ill. There’s a dope photo of it on the back of the DVD that I used to dig pretty heavily. -What’s the degree of angle on that downward Switch Nose Manual? I know the camera is embellishing it a bit, but still, that’s a steep ride to handle in that position. And then it’s backed up by the Frontside Bluntslide in to fakie. So he was feeling the backwards ride away on this thing. Another example of varying interpretations of the same spot. -What a way to go out, on a blaster of a bank to bank channel Ollie, which develops a very Gonz-like style near the end, as he pushes it out to make the distance.